For Virginia Tech researchers Margaret Couvillon and Roger Schürch, the Tower of Babel origin myth—intended to explain the genesis of the world's many languages—holds great meaning. The two assistant professors and their teams have decoded the language of honey bees in such a way that will allow other scientists across the globe to interpret the insects' highly sophisticated and complex communications. In a paper appearing in April's issue of Animal Behaviour, the researchers present an extraordinary foundational advance—a universal calibration, or for science fiction aficionados, a "babel fish," that translates honey bee communications across sub-species and landscapes. By deciphering the instructive messages encoded in the insects' movements, called waggle dances, the teams hope to better understand the insects' preferred forages and the location of these food sources. "Before we can feed pollinators, we need to know when and where they need food. 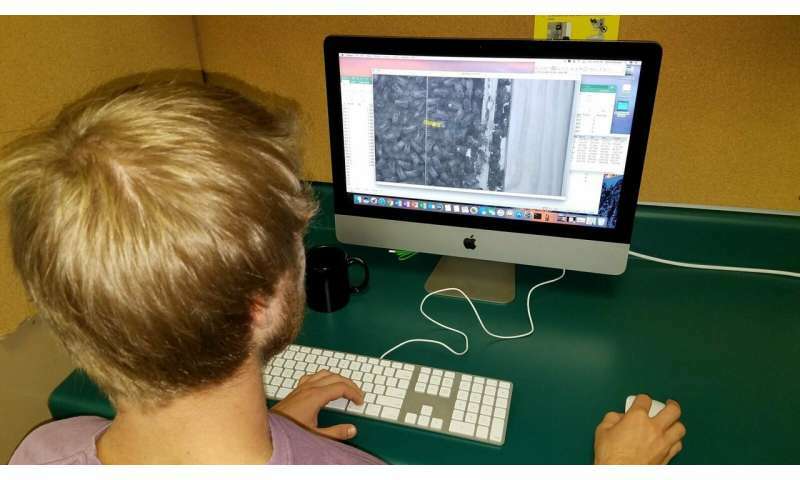 We must decode waggle dances," said Schürch, the paper's lead author. "So, this is a fundamental first step." The researchers analyzed the dances of 85 marked bees from three hives. Honey bee transmissions, as it turns out, have echoing agricultural, environmental, and economic ramifications. The USDA estimates that one out of every three bites of food in the United States depends on honey bees and other pollinators. In monetary terms, insect pollinators support crop yields and agricultural ecosystems and are believed to contribute an estimated $24 billion to the U.S. economy annually. The College of Agriculture and Life Sciences team's work is part of a larger grant from the Foundation for Food and Agriculture Research, a nonprofit established through bipartisan congressional support in the 2014 Farm Bill. Couvillon and Schürch, along with fellow Department of Entomology assistant professor Sally Taylor and Megan O'Rourke, an assistant professor with the School of Plant and Environmental Sciences, are examining pollinator behavior in different landscapes to determine where and when planting supplemental forage could have the most positive impact on pollinator nutrition and health. Nearly six decades ago, Karl von Frisch, a Nobel-prize winning ethologist, discovered that the angle of the dancer's body relative to the vertical encodes the direction of the forage, and the distance to the food source is communicated by the duration of the bee's dance. During the waggle dance, a successful forager returns to the hive and communicates the distance and direction from the hive to the food source by performing multiple, repeated figure-eight-like movements called waggle runs. Because of the challenge and cost of creating an original duration-to-distance calibration, von Frisch's calibration model, which is based on averages rather than data on individual bees, has served as the gold standard in the bee research community. Yet, according to Couvillon and Schürch, different bees conveying the same location can vary their waggle runs, and even individual bees repeating a run may alter their dance. Moreover, bees are inspired to dance only when they have located particularly tantalizing food resources. Anomalies such as these, coupled with a greater understanding of bees' highly developed cognition, inspired the husband-and-wife duo to develop their own distance-duration calibration system six years ago with bees that were predominantly A. mellifera mellifera in Sussex, United Kingdom. "We have collected this information from many bees in two different landscapes separated by an ocean and several years," said Couvillon. "However, there is still a lot we don't know about what the bees are feeding on. So, imagine decoding many dances and plotting them on a map to see where the bees are going. We wanted to do this by season to provide a comprehensive look at what they are foraging and where. This way, we can also see when it's harder for them to find forage and when it's easier." Team members spend months analyzing each dancer's movements to determine a distance-to-duration calibration. After arriving at Virginia Tech in 2016, the couple sought to determine whether or not their system could be applied to A. mellifera ligustica, a different genetic subspecies in the United States, and across a very different landscape. Guided by empirical knowledge and a new hypothesis, they also factored in noise—meaning dance variation among bees who visit the same location, but communicate this information a little differently—to improve model predictions. 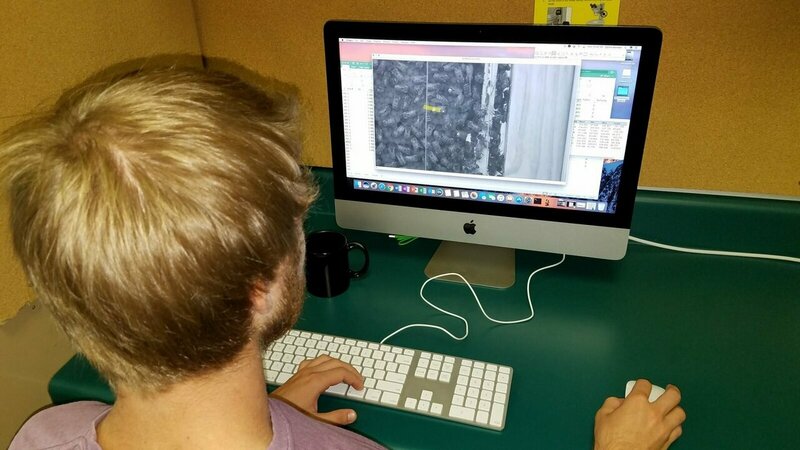 "It takes a lot of time, effort, and expense to conduct this kind of study," said Couvillon. "We decode dances by hand." Their meticulous calibration process requires that each bee is numbered and videotaped. Team members then spend months in front of computers analyzing each dancer's movements to determine a distance-to-duration calibration. "What also makes our research different is that we trained many numbers of bees and followed them great distances," said Schürch. 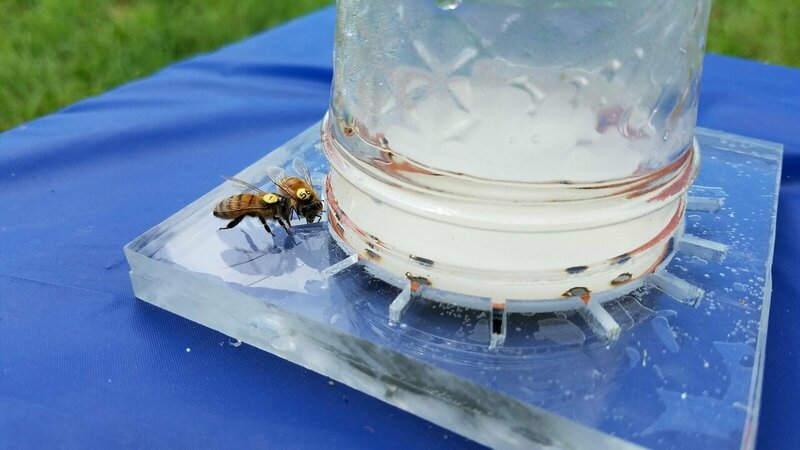 "You can train bees to go to a feeder and move it farther and farther away." For the Virginia study, the researchers analyzed the dances of 85 marked bees from three hives. They then compared their system to a previously published calibration. Their next step was to compare and then collate their data with all published calibration studies. In doing so, the team discovered that the individual noise, or variation between bees, was so high that the difference between location and sub-species was rendered biologically irrelevant. "While there were differences among populations in how they communicate, it doesn't matter from the bees' perspective," said Schürch. "We cannot tell them apart in terms of how they translate this information. There is huge overlap. In effect, a bee from England would understand a bee from Virginia and would find a food source in the same way with a similar success rate." By combining all of their calibration data, Couvillon and Schürch have made their work universal for other researchers, providing scientists around the world with a codex to decipher where bees are collecting food. Such knowledge stands not only to inform best practices for bee-friendly planting, but will be crucial to maintaining their populations. "We think that this research can enable bees to be used as bio-indicators," said Couvillon. "The bees can tell us in high spatial and temporal resolution where forage is available and at what times of the year. So, if you want to build a mall for example, we would know if prime pollinator habitat would be destroyed. And, where bees forage, other species forage as well. Conservation efforts can follow." Within the next few years, the researchers hope to further dismantle the Tower of Babel by automating the decoding process in order to make better and faster assessments of where bees go in real-time. "We are a year-and-a-half removed from bee analysis. Imagine if you got it instantaneously," said Couvillon.